​JACKSON, Wyo. (Jan 22, 2016) Teton Gravity Research, a leading youth culture, adventure and action sports media brand, and current steward of Safety Week 2016 (running Jan 18-24), is sharing 7 days of content designed to enlighten all categories of backcountry snow travelers, both experienced and would-be off-piste enthusiasts, on the necessity of cautious and knowledgeable decision making. A recent release shows a violent rag-doll fall endured by Female Skier of the Year, Angel Collinson. Akin to the nationally viral 1,600 ft. Ian McIntosh crash, Collinson was skiing in the Neacola Range in Alaska last spring when the snow under her skis suddenly changed from soft to ice, causing her to flip onto her back and into a massive tumble totaling over of 1,000 vertical feet. Being the tough-as-nails woman she is, Collinson comes to a halt miraculously unscathed, but the footage leaves viewers wondering how she escaped without injury. Angel Collinson has been filming with TGR since 2012 and has arguably become the best female in big mountain skiing. In 2015 Collinson earned a quiver of awards for her outstanding performance in this year’s movie from TGR, Paradise Waits. 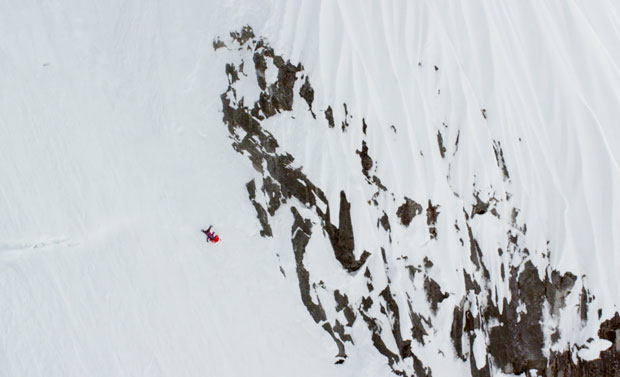 The Intern­ational Freeskiing Film Festival (iF3) garnished Collinson with Best Female Freeride Performance and won Best Line,Best Female Performance, the Women’s Powder Poll from Powder Magazine. The release of the recent crash footage demonstrates the humility and humanity of Angel in a light that is rarely shared with the world of action sports. As part of TGR’s Safety Week 2016, Collinson presents her accident in a series called Defend My Line where she breaks down her accident and discusses how things went wrong. To view this video clip and other Safety Week 2016 content, click here.